The Obama administration’s solar building boom continues. On Wednesday, Interior Secretary Ken Salazar signed the first lease to build a large-scale photovoltaic project on federal land in Nevada. It’s a significant move. The U.S. Bureau of Land Management controls a huge chunk of Nevada, prime territory for big solar power projects due to the state’s intense sunshine and a licensing process that is far less arduous than the one in neighboring California. 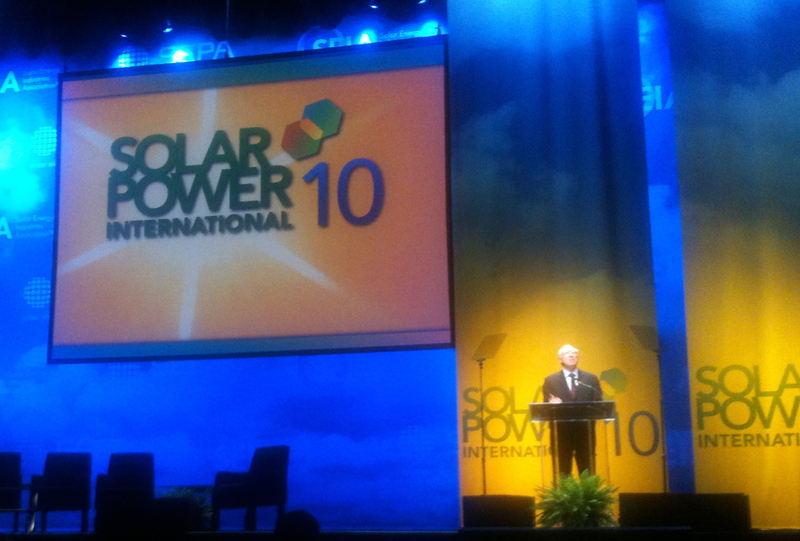 On stage at the conference, Salazar signed a lease for the 60-megawatt Silver State photovoltaic farm to be built by First Solar outside of Las Vegas. The secretary said it will supply enough electricity to power more than 15,000 homes. In recent weeks, Salazar has signed off on leases for three other solar projects in Southern California that would generate 1,124 megawatts of electricity. “We’re not done yet, we’re not done yet. Our work is just beginning,” said Salazar, who left his trademark 10-gallon hat back in Washington. A report released Wednesday by the Solar Foundation, a non-profit research group, said that there are 93,000 people employed in the solar business in the U.S. and that a survey of employers found that they plan to add 24,000 more jobs by August 2011. Rhone Resch, chief executive of the Solar Energy Industries Association, noted that a decade ago U.S. companies supplied 40 percent of the world’s photovoltaic products while today it’s just 10 percent. “We hope this is a sign of a turnaround and that policymakers take note,” he said Wednesday, referring to the solar employment study. While solar jobs exist in all 50 states, the study found that nearly 40 percent of them were created in California, the state with the most aggressive renewable energy targets. But expect the federal government to be driving demand for solar power — for its own use. “It’s important we all walk the talk,” Salazar said, noting that the Interior Department alone has installed more than 2,000 renewable energy projects.